So, my last post on our Germany trip was a bit of a Rudolf-love-fest (Hallo Rudolf! ), but let me tell you, Sandra's mum, Margit, is pretty damn awesome too! In the weeks leading up to our trip, Sandra was excitedly thinking of her childhood favourites and sending her mum requests for home-cooked lunches. (Typically the biggest meal of the day is at lunch, and you'd eat something smaller at dinner). It's also interesting to note that German food (and language) is extremely regional, so while these dishes are typical of Lampertheim (and southern Germany generally), you'd see very different dishes in, say, Bavaria or the north of Germany, and there'd certainly be different names for the same thing. Brockelbohnen is one of my favourites! 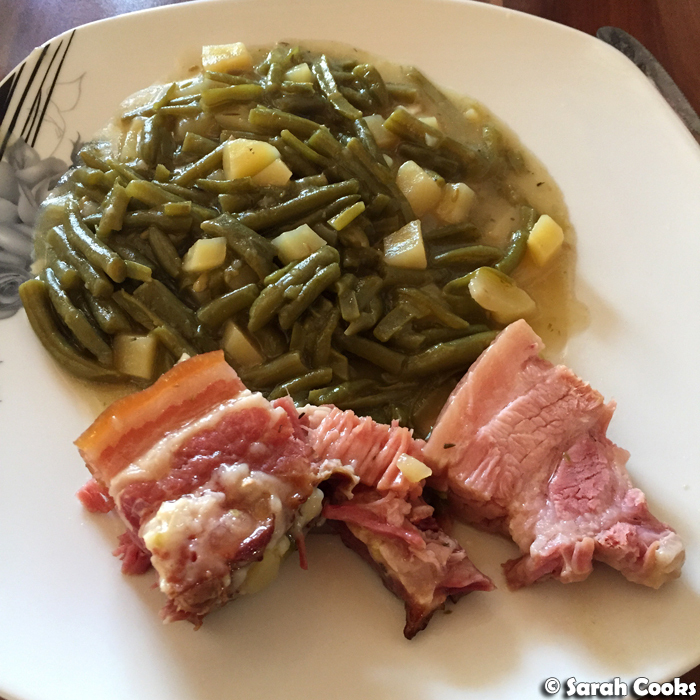 It consists of green beans cooked with potatoes in a pot with two types of pork belly (smoked & regular) and Bohnenkraut (the leafy tops from the bean plant, which is used as a herb). 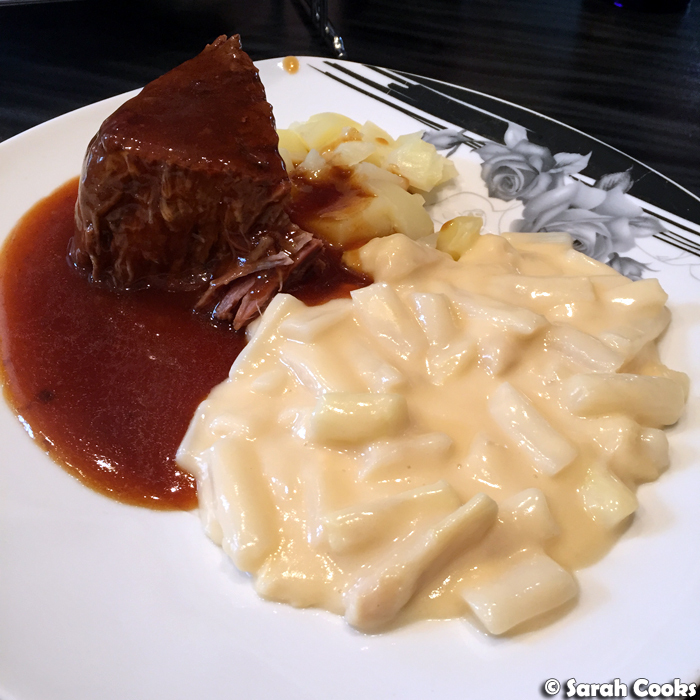 Schupfnudeln are little potato dumplings, not dissimilar to gnocchi. I've made these from Schnupfnudeln from scratch before, but in Germany you can buy them in packets at the supermarket. 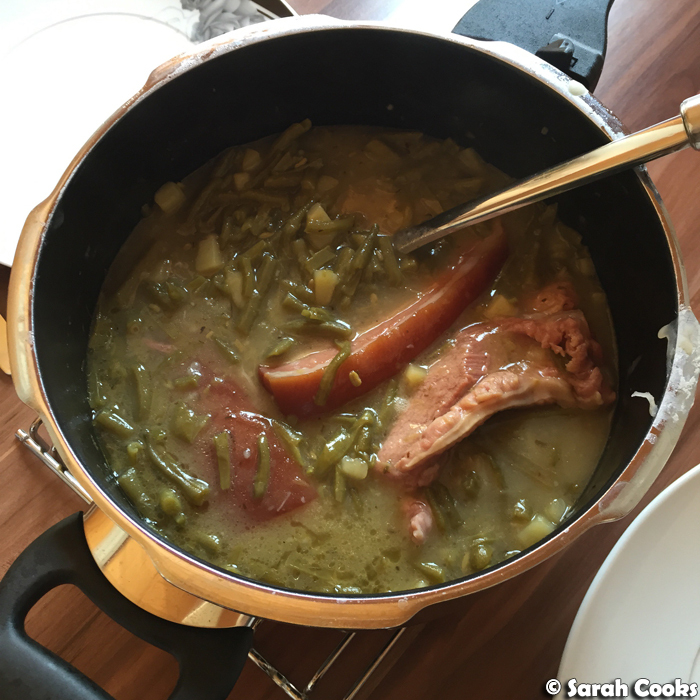 Here they were cooked in a pan with sauerkraut and slabs of Dörrfleisch (smoked pork belly). That's potato pancakes with apple sauce and chicken soup. 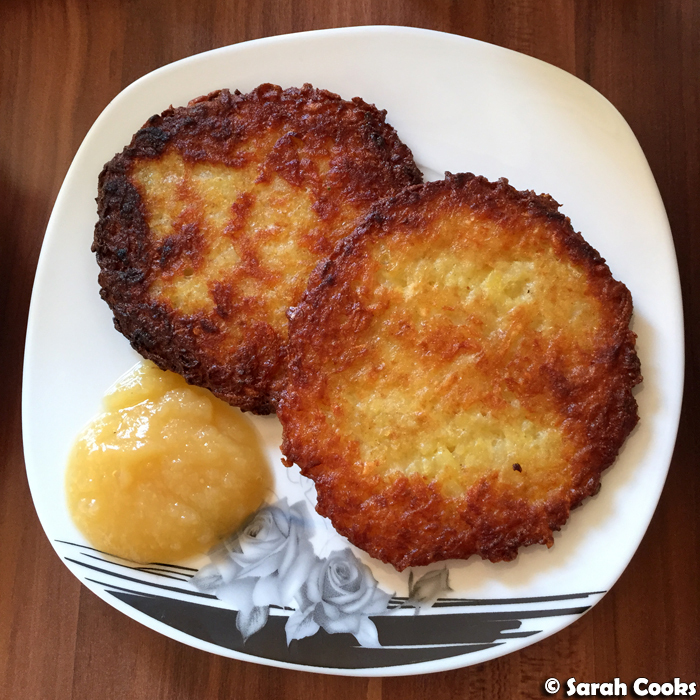 Kartoffelpfannkuchen also go by the name of Reibekuchen, Kartoffelpuffer and are just grated up fried potatoes. (Similar to the Schupfnudeln, these are something I've made from scratch at home, which takes quite a bit of time, but in Germany they sell good quality packet versions). They are crunchy and potatoey and delicious! These are typically served as a side dish to soup - in this case, a clear chicken broth. 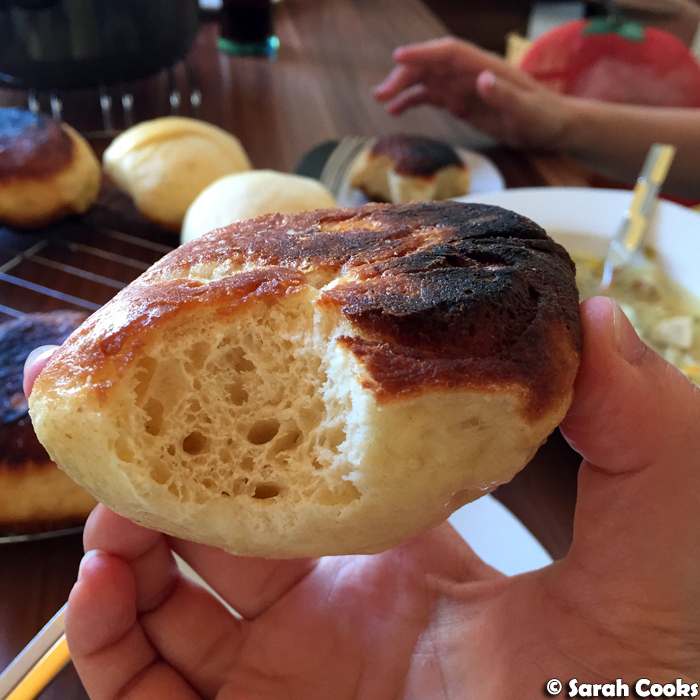 One of my favourite Suppeneinlagen (soup accompaniments) is Markklößchen! That's bone marrow dumplings (and see my Markklößchen recipe here). 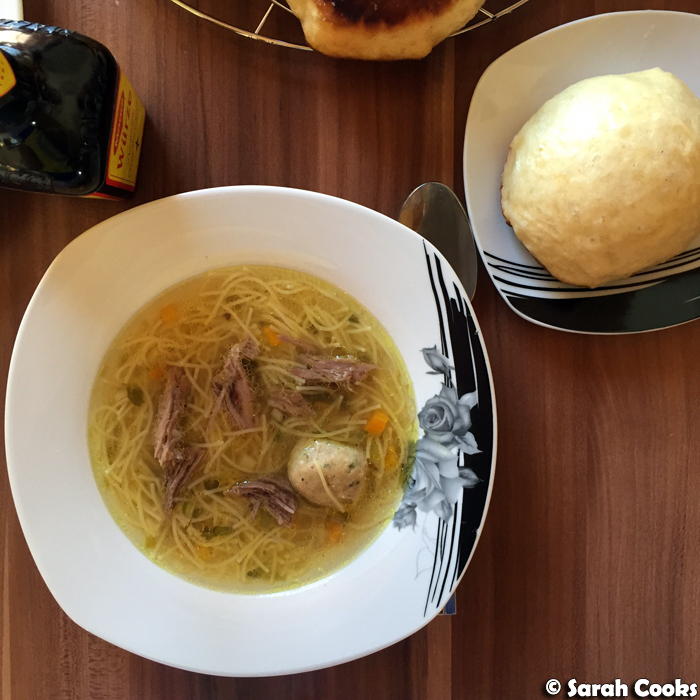 This time they were served in a beef soup, with that other bastion of deliciousness - Dampfnudeln! Literally: "steamed noodle", Dampfnudeln are made from a dough similar to Chinese bao dough (flour, yeast, water, salt) and are cooked potsticker style, so half steamed half fried. They're soft and fluffy inside and crunchy on the bottom. So good! You can also see some in the background have been made with the crunchy salt crust on both sides, made by special request. I've made these once since we got home - can't wait to share the recipe with you! Rinderrouladen ("beef roulade") are thin slices of beef, layered with gherkins and speck, then rolled up, tied with string and cooked in a pressure cooker. They kinda taste like a cheeseburger! 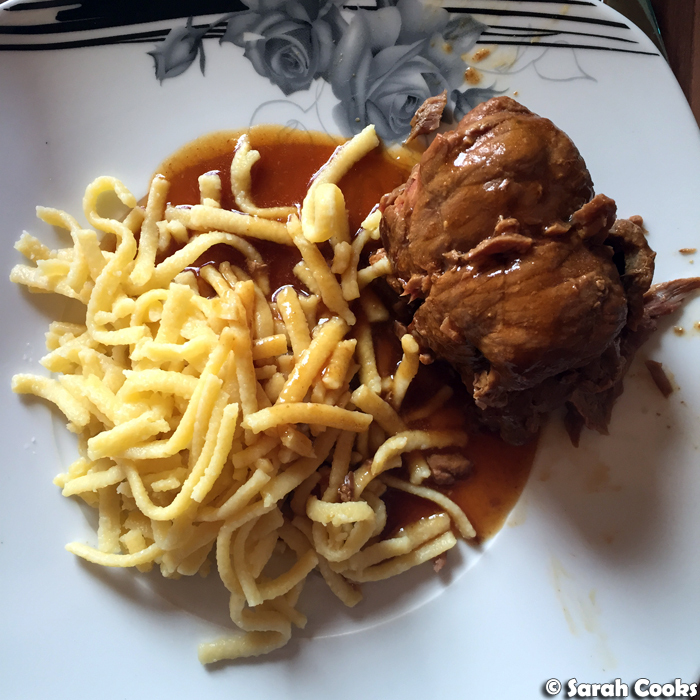 These were served with gravy and Spätzle - little short pasta. We've gotten into making Spätzle in a big way now that we're home (we have a Spätzle press and everything!) 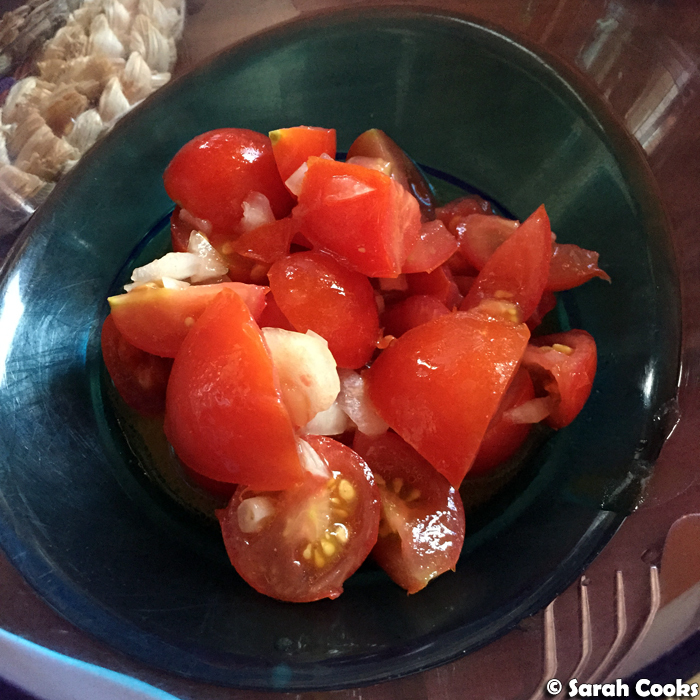 - recipe to come! Rinderbraten literally means roast beef, but is quite different from what I normally think of as roast beef - it's a large piece of beef, cooked in a pressure cooker until tender and falling apart. You can just see some boiled potatoes in the background, and on the side we have asparagus cooked in a white sauce. Lampertheim is known for its asparagus - it's not called Lampertheim Spargelstadt (Asparagus City) for nothing! - and white asparagus is much more common than green asparagus. 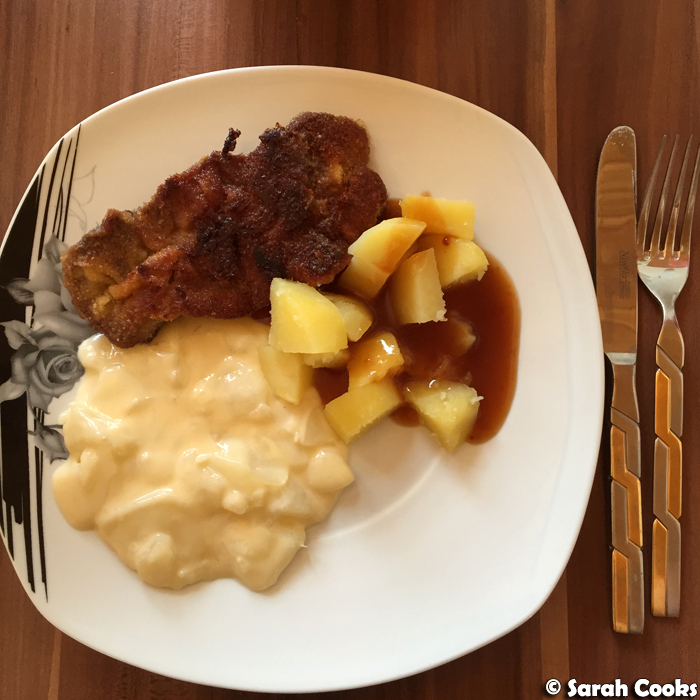 This one's a simple dish - crumbed pork cutlet, served with boiled potatoes and gravy, and kohlrabi cooked in a white sauce. (Just like the asparagus from the previous meal!) 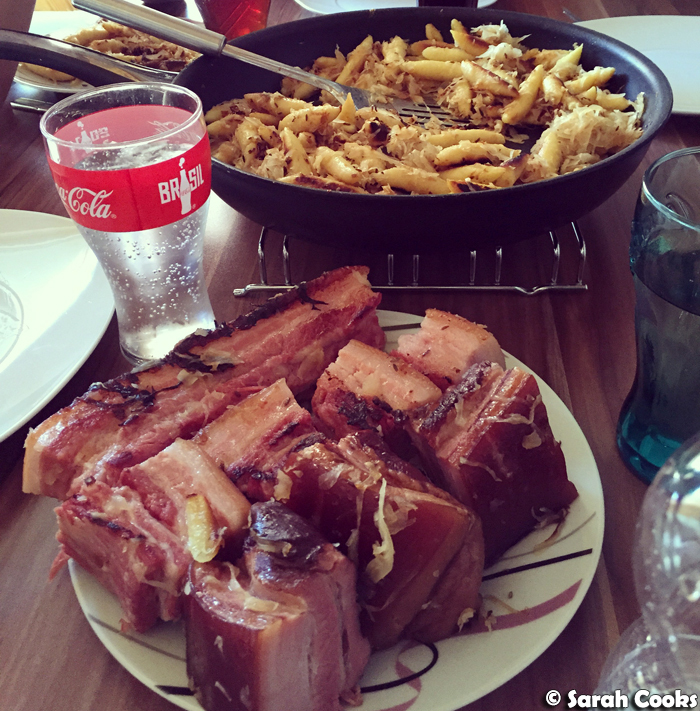 I totally love German comfort food like this! Hackbraten literally means "roast mince", and is like meatloaf. 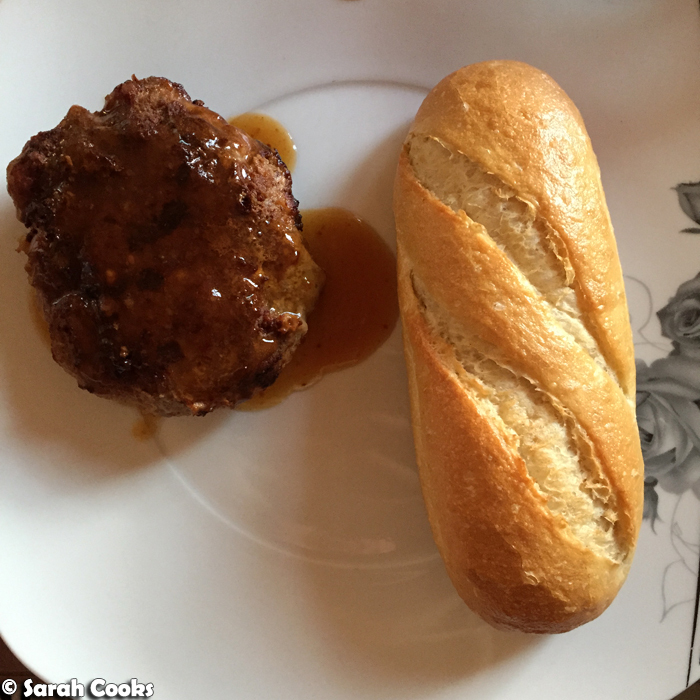 Margit makes them in small patties and fries them, as this is easier to cook and share. (Similar to Frikadellen, actually). Phew! That was a lot of delicious food! As I've stated above, the Germany trip got us all excited and interested in cooking German food again - so expect to see lots of German recipes coming up soon! 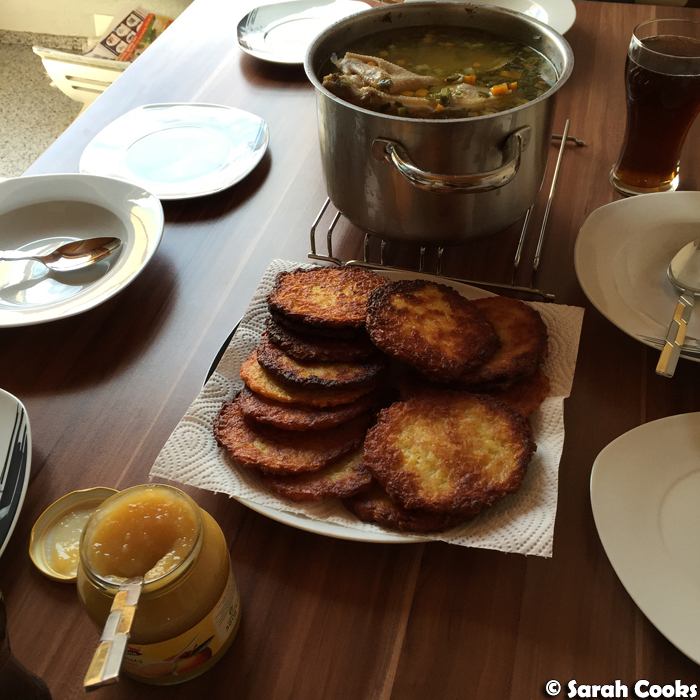 Awesome to get a glimpse of home-cooked German dishes! Love how crispy those potato pancakes look. And I'm definitely a big fan of spatzle! Love all the carbs but that chicken broth looks divine. Pure comfort food! I know so little about German food! I've never actually been to Germany so this was really enlightening. Love the sound of all of that meat and the Dampfnudel! SIGH. This is a great post! My old partner used to make what you've called Brockelbohnen. I always thought it was hilarious cos she called it "Bohnensuppe", but of course it had a huge chunk of Kasseler in it! Bring on the recipes! 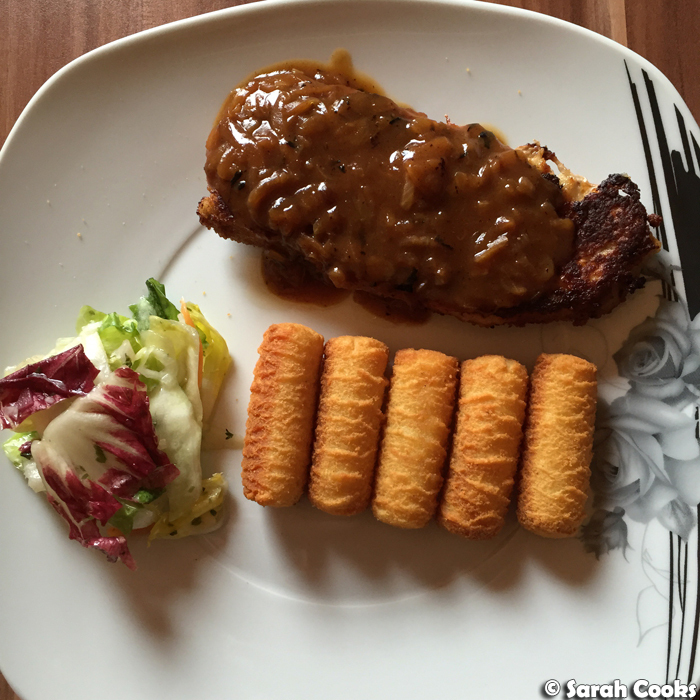 I know nothing about German food but it looks so tasty - especially that asparagus, yummy! 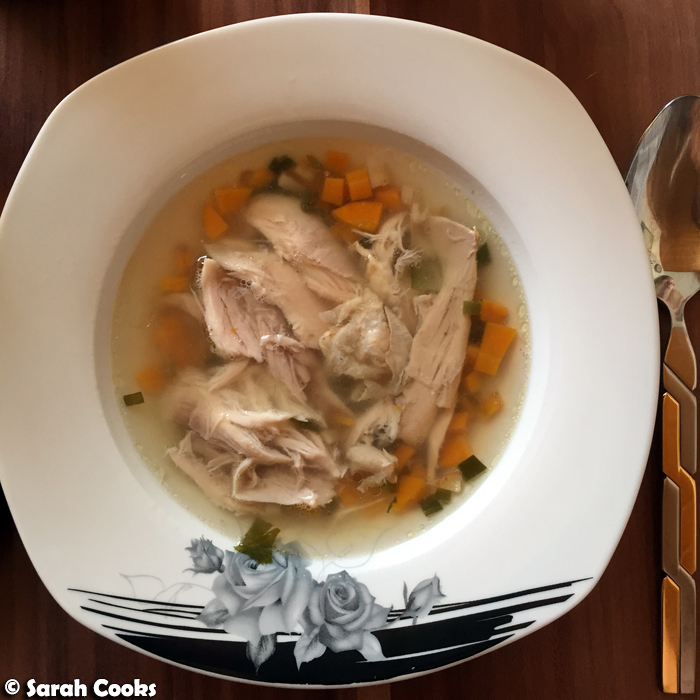 The chicken soup with the sides tempts me the most, looks like a great mix of flavours!